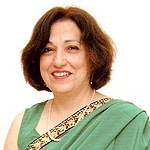 Shernaz Cama (Dr.) has been teaching at Delhi University since 1983 and has been Head, Department of English at Lady Shri Ram College. She has worked on Blake and Zoroastrianism, for her PhD researches at the British Museum and the School of Oriental and African Studies in London. She writes for academic journals and magazines and has been a Resource Person for the Centre for Professional Development in Higher Education, giving lectures at various Universities under this scheme. She has written several books on Blake as well as on Zoroastrian topics and guided senior scholars in research projects. On the invitation of UNESCO Dr. Cama initiated a Project on the Preservation and Promotion of Parsi Zoroastrian Culture and Heritage (Parzor). As Honorary Director of this Project she has recorded Oral Traditions and creating awareness of the rich culture and heritage of this community. She has produced three movies under the project. Dr. Cama has also headed an international six country multinational candidature for the UNESCO award “Masterpieces of the Oral and Intangible Heritage of Humanity”, called “Asha: the Law of Harmony – A Study of Environmental Consciousness in Zoroastrian Rituals”. Dr. Cama was the Indian Representative for the Navroze multinational candidature file, headed by Iran, which has been declared a Masterpiece of the Oral and Intangible Heritage of Humanity in 2009. Dr. Cama has been awarded the Mazda Education Foundation Award and Mancherji Edalji Joshi Memorial Award for Outstanding Contribution to the Zoroastrian community. She is the Parsi representative for India on the Board of the International interfaith movement, The Temple of Understanding.